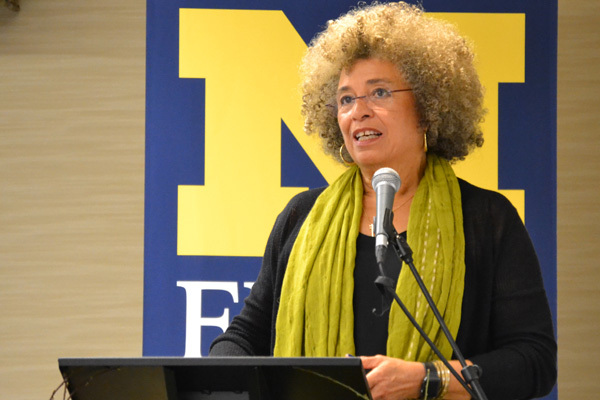 Angela Y. Davis has concluded her time at the University of Michigan-Flint as the 2015-2016 Myron and Margaret Winegarden Visiting Professor. 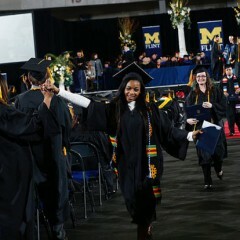 During her time on campus, Davis visited classrooms, presented separate forums for the public, faculty, and students, and held question and answer sessions with each audience. The visiting professorship, run through the Office of the Provost and Vice Chancellor for Student Affairs, was formed in 2001 through a generous gift from the estate of Margaret Winegarden. 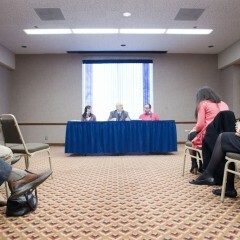 Visiting professors are chosen by a faculty selection committee. Many of the themes she covered during her first talk were picked up at the subsequent forums, giving audience members multiple chances to engage deeply with Davis. 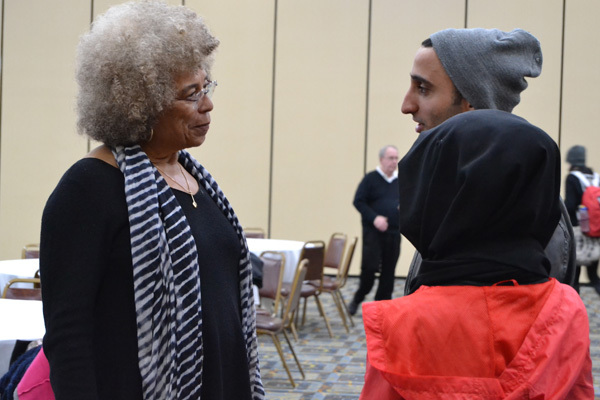 At each UM-Flint event, Angela Y. Davis took time to meet with her audience members. On Wednesday, March 23, Davis presented “Critical Theory and Pedagogies of Resistance” to a large number of faculty at UM-Flint. Introductions were given by Vahid Lotfi, Senior Vice Provost for Academic Affairs and Dean of Graduate Programs, and Susan Gano-Phillips, Dean of the College of Arts & Sciences. 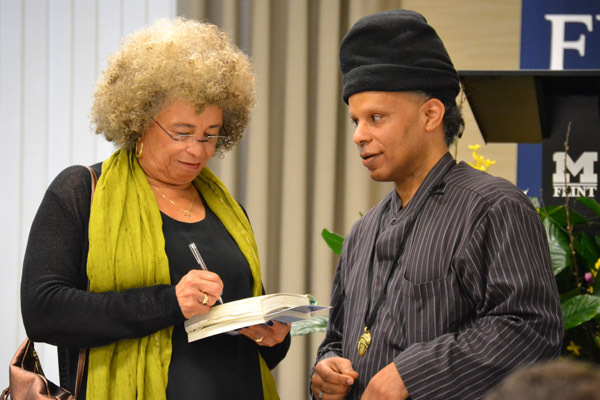 Angela Y. Davis signs a book for a faculty forum participant at UM-Flint. Davis began by speaking about her personal trajectory in her “own quest for the meaning of freedom.” She shared her story of growing up in a highly segregated city. She said, “as a young person, I thought about freedom all the time.” Davis had imagined that if she went north, she would find freedom, so she moved to New York for the latter part of high school. She noted that though her new school was more progressive—allowing girls to wear pants, students to address teachers by their first names, and having Marxist history teachers— “something was still wrong.” She learned that racism isn’t always overt. 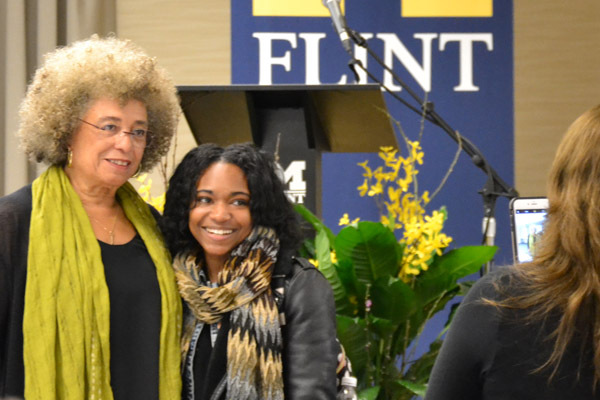 Angela Y. Davis speaks with students after her final UM-Flint forum. Davis’ journey next took her to France at the peak of the Algerian revolution. There, said Davis, “I found international solidarity. The sense of belonging in something so much larger than myself. I found freedom.” Davis used the stories of her past to connect to current issues in the world: the violence at the Brussels airport, embedded racism in social institutions, and the prison system. She showed students how the experiences of her life created the framework for her activism. 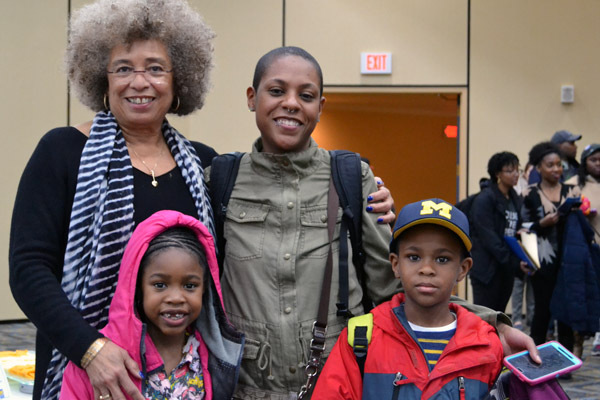 Angela Y. Davis with UM-Flint social work major Kristen Twitty and her children. 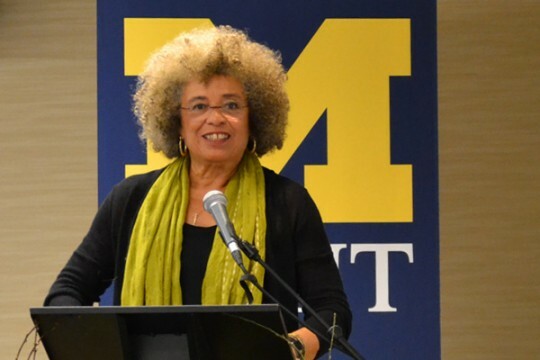 Throughout her talks, Angela Y. Davis kept returning to the idea that just as the ills of this world are interconnected, so should the response be. She provided inspiration to each of her audiences, but also tasked them with looking forward, thinking differently, and challenging the assumptions that are often made in society. 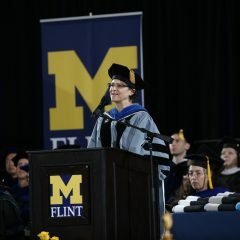 For more information on UM-Flint’s visiting professorship, including past recipients, please visit the website for the Office of the Provost & Vice Chancellor for Academic Affairs.